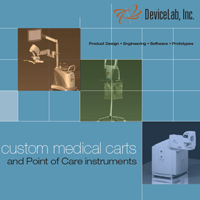 Custom medical carts are DeviceLab’s specialty. We have successfully completed 16 turnkey, medical cart development projects. Our team of experts will guide you through the entire process from concept, through industrial design and styling, ergonomics, engineering, prototyping, testing, FDA regulatory approval, documentation and pilot production. Our expertise includes surgical and POC (point of care) carts for medical, diagnostic and laboratory use. Based in Orange County (OC) Southern California, we frequently work with customers in need of custom laboratory equipment design throughout Southern/Northern California (CA) including San Diego, Orange County (CA), Los Angeles (LA), San Jose and the San Francisco Bay Area. Within the US, we have worked with customers and medical professionals throughout the West Coast (CA, WA, OR, AZ), Midwest (OH, IL), East Coast (NY, NJ, CT, PA) and South West/South East (TX, FL, NC, SC). Within our areas of specialty, we work with international clients in Europe (EU nations, primarily Germany, UK and France), Mexico, South America (Argentina and Brazil) and Asia (primarily China, Japan, India, Taiwan and Singapore).